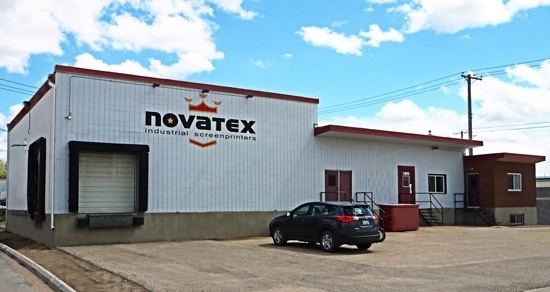 Novatex Serigraphics Inc. is a well know printing company in Saskatoon, SK , providing professional printing services for over 25 years. Contact our printing specialists, to know more about the printing services we provide in Saskatoon and the surrounding areas. Novatex Graphics has the knowledge and technology to handle your printing requirements, regardless of whether you need 1 or 5000. For over 25 years, Novatex Graphics has been known for screen printing high-tech overlays, panels, faceplates and CSA certified labels for electronics, mining and agricultural manufacturers, as well as a variety of decals, tags, coroplast signs and banners for a wide range of businesses in Saskatchewan and Alberta. The screen printing process has remained the same, but most of our printing today is done with environmentally friendly UV cured inks, and it remains the method of choice for larger orders of signs and decals, as well as for any metal or plastic item that needs to have the most durable ink possible printed onto it to survive in harsh environments. Our new Roland LEF-20 flatbed printer expands our capabilities even further. Now, we can print prototypes and small quantities of lexan overlays quickly and economically, as well as serialized labels on 3M embossing foil and polyesters. It also allows us to economically logo and personalize small numbers of objects made of glass, plastic, wood, leather, and more.